Tom Ford new 2013 sunglasses season is here with a Beatle look. The Tom Ford Lennon brings back the sixties when John Lennon stole the show. This plastic rounded square shaped sunglass is available in a choice of light tinted lenses. The round eye sunglasses, which over the years have become iconic with famous stars are now massively back in fashion. The round eye sunglass is a perfect lens design for long face shapes. Tom Ford Lennon has the t logo on each side. This week sees the release of the hugely successful James Bond Skyfall Movie on DVD and Blu-Ray, putting the excellent Tom Ford TF144 Marko sunglasses right in the spotlight once again. Skyfall became the highest grossing film of 2012, took over £20 billion in its opening weekend and became the highest grossing Bond film ever here in the UK. There’s no denying that the image of Bond himself plays a huge part in the success of the films, and the decision for Bond to wear the Tom Ford TF144 Marko sunglasses continued this success. Speaking in a recent behind-the-scenes video, ‘Skyfall’ costume designer Jany Temime explained the thought-process behind the Bond look. The gunmetal frame and blue lens of the Tom Ford Marko perfectly compliment any smart dressed individual, whilst at the same time are casual enough to be worn with everyday attire. To mark the occasion, we are offering an excellent discount of £15 on the Tom Ford TF144 Marko sunglasses, this is a limited time offer, so be quick! Not only is he Britain’s first ever Tour de France winner, Bradley Wiggins surpassed Sir Steve Redgrave as his country’s most decorated Olympian at the London 2012 Olympics. Named BBC Sports Personality of the Year 2012 in December, Mod icon Wiggins defies all of the cycling stereotypes. In fact it was reported in The Sun yesterday that his award takes pride of place in his local pub (the Original Farmers Arms in Eccleston) where Bradley is a regular. In the New Year’s Honours List, Bradley has also been awarded a knighthood. He stated that it was a fitting tribute for himself and the other athletes recognised on the list. When it comes to his sunglasses, Sir Bradley certainly likes Oakley. When cycling, he wears the Oakley Jawbone and it is said that this is his favourite sports frame. He is also a big fan of the classic Holbrook frame too (pictured). Tom Ford 2013 sunglasses range is available to view and buy at Sunglasses Direct. The renowned American designer has introduced a powerful new selection of stylish sunglasses for the fashion conscious. New Tom Ford models that have arrived are Lana 280, which is a modern version of the ladies plastic upswept design. The Lennon 288 is a mens plastic aviator available in the stunning Tortoise with blue lenses. Also for men is the Tom Ford Flynn, which will be the must have mens sunglasses for 2013. This round plastic option is a retro classic from the 1940’s, with the iconic keyhole bridge design. For the smaller lady is the Anastasia 303, which is a smaller upswept cat eye style available in bright colours. Sunglasses-Direct has all these new Tom Ford sunglasses available to buy online plus all the best seller Tom Ford sunglasses from previous years. Our sunglasses shop Stephen Donald Eyewear in Nottingham city centre has all Tom Ford sunglasses to view. Oakley have released their latest goggles named Airwave. These high tech goggles are brimming with features…such as GPS, Bluetooth® and more with a host of on-board sensors from a small screen inside. This screen can display all sorts of information including location, speed, distance and altitude. Using Android technology the goggles are paired with your mobile phone via Bluetooth to deliver this information including calls, messages and even your music too. Add to this the world-class performance, protection and comfort we have come to expect from Oakley’s goggles and you can see why these are bound to be a hit! The goggles benefit from Oakley Switchlock™ Technology which means that you can take advantage of the optional lens. F3 anti-fog technology, dual-vented lenses and Oakley Plutonite® lens material filters out 100% of all UV light. Oakley Airwave Goggles have a premium price tag at £500.00 but for a range of more affordable options, click here. In the surprise transfer move of the football season, Dutch legend Edgar Davids has signed for npower League Two outfit Barnet. The new signing, the highest profile in the club’s 124-year history, will adopt a player-manager role- sharing Head Coach responsibilities with, the incumbent, Mark Robson. Davids, now 39, will return to on-field service after a two-year absence. It is, indeed, the second time that he has come out of retirement. In 2010, he broke another two-year absence to embark on a short spell with Crystal Palace. Since leaving Palace, Davids has kept himself active through a variety of community and charity projects. Not least of these has been his involvement with a series of global street soccer initiatives. Attesting to his great physical conditioning, an official statement has suggested that Davids could be ready to make his playing re-debut within the next fortnight. An on-field return, would mark the beginning of a 20th footballing season for the iconic Dutchman. In his 19-year career, to date, Davids has earned 74 caps for his national team, won a Champions League medal with Ajax, and helped Juventus to three Serie A titles. What’s more, Davids has been able to transcend the confines of football and become one the most historically-significant proponents of the, high-tech, Oakley sports eye-wear range. The glaucoma sufferer’s endorsement of the Oakley Racing Jacket design, led to the frame becoming a worldwide best-seller. Oakley embraced this buzz by releasing the Oakley Pitbull frame, which bears the nickname of the tenacious ball-winner. Both designs are influenced by the goggles worn by action sports participants, including snowboarders and cyclists, and offer ultra-reliable protection to the eyes of both sportsmen and everyday wearers. “The capture of Davids is a statement of intent by our club, to improve results and lay further foundations for the future. In his new role, Davids will be actively involved in training, drawing upon his experiences at elite nurturing clubs, such as Ajax and Barcelona, to aid in the development of Barnet’s youngsters. The Underhill club currently lie at the foot of the English League pyramid, having yet to win a game this season. Important news, for those hoping to capture the James Bond image, in time for the October 23rd premiere of ‘Skyfall’. Fresh leaks have revealed images of Hollywood megastar Daniel Craig wearing a pair of Tom Ford TF144 Marko frames on set, during production. These images have confirmed long-standing rumours that Bond’s relationship with Ford would carry over from the ‘Quantum of Solace’ movie. With that being said, Craig’s presentation in ‘Skyfall’ will not, 100%, fit the Bond archetype. Temime has been the catalyst behind a subtle evolution, with the classic film series now reaching the age of 50-years-young. “Sometimes doing a lot of difficult stunts with beautiful, glamorous women in exotic locations. That’s what’s expected to be seen, so you have to give a new look to a very successful image. They wanted suits that were very near his body. Very supple suits that moved with him. 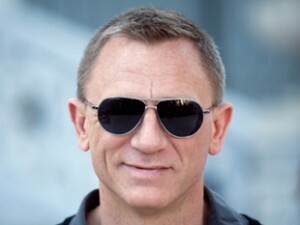 If the leaked images are anything to go by, the bold edge of Ford’s uniquely tailored suit style will be reflected by Bond’s choice of eyewear. A suited and booted 007 is set to traverse a contemporary story world, carrying an air of indestructibility, with metallic silver and royal blue shades being predominant colour-themes throughout the motion picture. Needless to say, ‘Skyfall’ is set to be one of the biggest box office smashes of the year. Once the film hits the big screen, sales of Tom Ford fashion items are sure to boom, which will turn the TF144 Marko and its sister ranges into gold-dust. Rush over to our Tom Ford brand page now, to get the look while stocks last! The 1986 film franchise, that first popularised the Ray-Ban Aviator 3025, is on its way back, bringing its iconic style along with it. Hollywood megastar, Tom Cruise is heavily rumoured to be reprising his lead-role in the long-awaited sequel to ‘Top Gun’. Rumour has it that Cruise’s character Maverick will, this time around, be a test pilot for the new F-35 Joint Strike Fighter. This theory was, recently, backed up by the program manager of Lockheed Martin, Tom Burbage, during National Aeronautics Association lunch event. Burbage intimated that the start of filming, at the aerospace company’s base, was imminent. It’s interesting to note that, in the two-and-a-half decades since the original ‘Top Gun’ was released, un-manned crafts have taken over the world of warfare. So much so, that the F-35 may well be the last piloted fighter aircraft to be made in the Western world. The choice to feature the West’s last manned fighter in the movie sequel could truly capture a moment in time. Nowadays, a drone pilot is said to see more action in a week than a traditional fighter pilot does in a month. Entire squadrons of US military fighter pilots have made the transition from using manned aircraft to using, the safer, remote-controlled drones. Many of the best test pilots now graduate already armed with extensive drone experience. The classic F-14 Tomcats, flown by Maverick and Iceman in the original movie, were retired from operational service in 2006. The ‘Top Gun’ crew’s real life counterparts, the Naval Air Forces, have begun testing the futuristic X-47B drone, which is likely to end up flying alongside the last of the manned fighter jets. It’s possible that such drones will be a feature of ‘Top Gun 2’, when it hits the silver screen. Indeed, if it’s to be grounded in reality, the movie will need to throw light on the challenges faced by modern fighter pilots. In the age of the drone, writers Christopher McQuarrie and Peter Craig must find a balance between the robotic nature of modern warfare and the glamourous dog-fighting of the original film. Meanwhile, unlike manned fighter planes, Aviator shades are irreplaceable. We received a great response to July 18th’s blog, a guide to indentifying counterfeit Ray-Ban sunglasses, which can be found here. Be wary of websites with Far Eastern connections, particularly connections of the clandestine kind. Fake Western fashion goods are beginning to flood the Chinese and Japanese markets. In some Eastern circles, wearing fake goods is considered to be an acceptable rite of passage into legitimate designer brand buying. One way to check the legitimacy of a site’s purported geographic location is to run a www.whois.net domain name search. If a site that presents itself as a Western site is registered to a Chinese organisation, you may have a bootlegger on your hands. Why not try running a WhoIs search using www.sunglasses-direct.co.uk? At this juncture, it should be added that there are legitimate dealers in China. However, Far Eastern legal systems are often less well-equipped to eliminate fraud than their Anglo-American equivalents. Customers should apply the same kind of wariness when buying on eBay – although it can be tricky to accurately ascertain which eBayers are trustworthy. Checking a product description for basic English errors can often be a useful tactic. Also, typically, if an eBayer goes to excessive length to tell you that their item is “legitimate”, they might just have a guilty conscience. Wishing you a happy (and safe) shopping spree! Oakley Frogskins: It’s 1984 all over again! A smash hit with fans of 80s retro, Frogskins are the design that put Oakley sunglasses on the map. Re-issued for a new era, their vibrant colours have attracted a diverse assortment of celebrity wearers; from Kanye West to Liv Tyler and from Rihanna to Valentino Rossi. Speaking of Rossi, it’s a little known fact that Oakley’s original products were a form of cutting-edge motorbike handgrip. In the mid 1970s, founder Jim Jannard created a small-scale “garage brand” and named the company after his pet dog. Jannard’s holistic love of bike-sports meant, however, that it wasn’t long before Oakley made its first steps into eyewear production. The company’s first sport-specific sunglasses were introduced in 1984. Soon, Oakley had branched out further, producing all-round performance sunglasses. With their, unmistakable, Iridium-finish lenses, Frogskins went on to dominate the late ‘80s eyewear revolution. The kaleidoscopic range captured the imagination of a generation. Twenty years on, the Oakley Frogskin has been re-issued, with a number of modernisations having been made, increasing the strength and flexibility of the design. –	Made in Japan, the original Frogskins used separate, metal hinges. On the current, Italian, model, the hinges are the integrated into the frame. –	The modern re-vamped Frogskin is constructed from a nylon-based material. –	Frogskins now possess bevelled hinges, rather than the outmoded cyndrical variation. –	Historically, the prominent Oakley logos were simple screen-prints. Today, the glasses feature a raised emblem – designed to combat counterfeiting. –	Contemporary Frogskins also benefit from the modern technical lens geometry that has become a synonymous with the name “Oakley”.